One of the most talented actors in Bollywood, Rajkummar Rao is coming back with his next film, titled as Newton. Directed by Amit V. Masurkar, it is the black comedy and also stars Pankaj Tripathi, Anjali Patil, Raghuvir Yadav and Sanjay Mishra in key roles. On Tuesday, makers unveiled the new poster of Newton, confirming it’s release date. 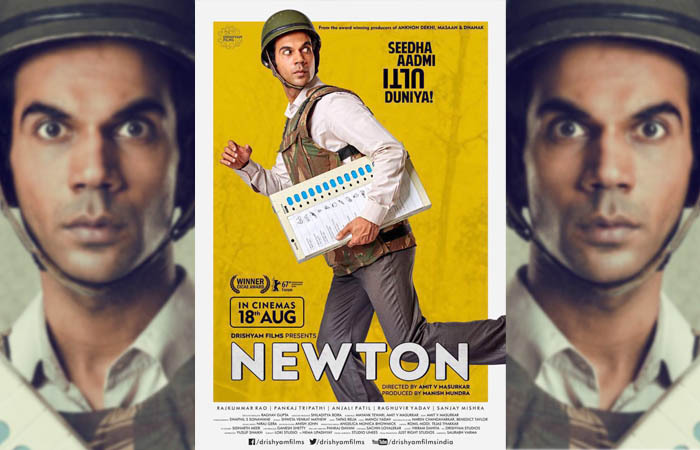 The picture features Rajkummar Rao running with an EVM (Electronic Voting Machine) in hand and the caption is also there, “Seedha Aadmi Ulti Duniya!”. Rajkummar himself took to twitter to share the poster of his forthcoming film. He wrote, “He is coming. #Newton #SeedhaAadmiUltiDuniya.”. Undoubtedly the new poster promises for an interesting story and after this, now fans are looking forward to it’s trailer, which is likely to be released soon. 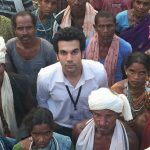 Produced by the maker of critically acclaimed Ankhon Dekhi, Masaan & Dhanak, Manish Mundra, Newton is the story of a rookie government clerk Newton Kumar, sent on election duty in a Naxal-affected town inside the forests of Chhattisgarh. Faced with the apathy of security forces on one hand and the looming fear of guerrilla attacks by the Naxalites on the other, Newton tries his best to conduct free and fair voting despite the odds stacked against him, all with a dollop of humor. 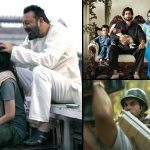 The film got standing ovation in it’s world premiere at the 67th Berlin International Film Festival and also won the CICAE Art Cinema Award in the Forum segment. Newton is set to be released on 18 August 2017, opposite to Ashwiny Iyer Tiwari’s Bareilly Ki Barfi which also has Rajkummar in a lead role. Shraddha Kapoor and Siddhant Kapoor’s Haseena Parkar (Haseena) is also scheduled for the same day.